1697: born in Kamigata. His father was a rônin named Terasaka. He was adopted at the age of 6 by the actor Sakakiyama Koshirô I. 11th lunar month of 1708: he took the name of Sakakiyama Shirotarô I and started his career as a zamoto, producing in Kyôto the kaomise drama "Ryôshû Renri no Matsu". 11th lunar month of 1709: Shirotarô produced in Ôsaka the kaomise drama "Chigo Daimyô Kyô Miyage". Fall 1711: Shirotarô and his father Sakakiyama Koshirô I settled in Kyôto. 11th lunar month of 1711: Shirotarô produced at Hoteiya Umenojô's theater the kaomise drama "Kikenjô", which celebrated the shûmei of Takioka Saburoshirô and Murayama Heijûrô II. 11th lunar month of 1713: Shirotarô produced at Kameya Kumenojô's theater the kaomise drama "Eitai Kogane no Ichigura". 11th lunar month of 1714: Shirotarô produced at Kameya Kumenojô's theater the kaomise drama "Azuma-zukuri Ôdaidokoro", in which he played the role of Nitta Yoshisuke. Fall 1716: first Kabuki adaptation of Chikamatsu Monzaemon's masterpiece "Kokusen'ya Gassen", which was produced by Shirotarô in Kyôto at Miyako Mandayû's theater [casting]. 11th lunar month of 1717: Shirotarô produced in Kyôto at Hayagumo Chôdayû's theater Sakakiyama Kansuke I's kaomise drama "Ômu Gaeshi Momotose Gitsune", in which he played the role of Fukakusa no Shôshô; his stage partners were Shibazaki Rinzaemon I, Kirinami Takie, Yamada Jinpachi, Bandô Hikosaburô I, Sawamura Otoemon I, Sakakiyama Koshirô I, Katayama Kozaemon, Matsushima Moheiji, Bandô Matajûrô I and Onoe Samon. 2nd lunar month of 1718: First Kabuki adaptation of Chikamatsu Monzaemon's drama "Nihon Furisode Hajime", which was produced by Shirotarô in Kyôto at Hayagumo Chôdayû's theater; Shirotarô played the role of Ama Hikomaru [casting]. 11th lunar month of 1718: Shirotarô produced in Kyôto at Hayagumo Chôdayû's theater the kaomise drama "Chôseiden Kogane no Ishizue", in which he played the role of the wakadono Yukienojô. Fall 1723: Shirotarô and his father Sakakiyama Koshirô I went back to Ôsaka after 12 seasons spent in Kyôto. 11th lunar month of 1723: Shirotarô produced at the Ônishi no Shibai the kaomise drama "Fukujukai Kogane no Minato". 11th lunar month of 1725: Shirotarô produced at the Ônishi no Shibai the kaomise drama "Gokoku Jôju Naniwa no Yakata", in which he played the role of Fuji Daijûrô. 11th lunar month of 1726: his father Sakakiyama Koshirô I went to Kyôto but Shirotarô stayed in Ôsaka, playing at the Kado no Shibai the role of Aioi Tsurutarô in the kaomise drama "Bunbu Aioi no Matsu", which was produced by Fujii Hanamatsu and celebrated the shûmei of Fujikawa Hanzaburô II. 11th lunar month of 1727: Shirotarô played at the Naka no Shibai the role of Ikuta Mojigorô in the kaomise drama "Imosegami Aioi no Futabayama", which was produced by Yamamoto Kyôshirô I. Fall 1728: Shirotarô went to Kyôto. 11th lunar month of 1728: Shirotarô played the role of Higuchi Gensuke in the kaomise drama "Tokiwagura Kogane no Ishizue", which was produced by Tamiya Hannosuke at Kameya Kumenojô's theater. 1st lunar month of 1729: Shirotarô's rank in the Kyôto hyôbanki, tachiyaku section, was jô-jô-(shiro)kichi (superior - superior - (white) excellent). 11th lunar month of 1729: Shirotarô produced at Kameya Kumenojô's theater the kaomise drama "Fukuju Yakata Wagô no Futabashira". 11th lunar month of 1730: Shirotarô produced at Kameya Kumenojô's theater the kaomise drama "Eiraku Shiki no Kogane". 1st lunar month of 1731: Shirotarô produced in the same theater the new year ni-no-kawari "Keisei Mikasayama"; he played the role of the karô Imai Sanzaemon. 11th lunar month of 1731: Shirotarô played at Miyako Mandayû's theater the role of Umebayashi Hyakutarô in the kaomise drama "Hiragana Imagawajô". 1st lunar month of 1732: Shirotarô's rank in the Kyôto hyôbanki, tachiyaku section, was jô-jô-(hanshiro)kichi (superior - superior - almost excellent). 9th lunar month of 1732: first Kabuki adaptation of Matsuda Bunkôdô and Hasegawa Senshi puppet theater drama "Dan no Ura Kabuto Gunki". The play was produced by Shirotarô at Miyako Mandayû's theater in Kyôto [casting]. 11th lunar month of 1732: Shirotarô played at Miyako Mandayû's theater in the kaomise drama "Hatsu Butai Kogane no Ishizue", which was produced by Anegawa Chiyosaburô I and celebrated the shûmei of both Kirinoya Gonjûrô II and Haruyama Genshichi II. 1st lunar month of 1733: Shirotarô's rank in the Kyôto hyôbanki, tachiyaku section, was jô-jô-kichi (superior - superior - excellent). 11th lunar month of 1733: Shirotarô produced at Kameya Kumenojô's theater the kaomise drama "Chôseiden Kogane no Shikigawara", which welcomed back his father Sakakiyama Koshirô I in Kyôto. 11th lunar month of 1734: Shirotarô produced at Kameya Kumenojô's theater the kaomise drama "Oyayuzuri Kogane no Katokugura", in which he played the role of Matsugane Jônosuke. 11th lunar month of 1735: Shirotarô played the role of Kanemori Gensuke in the kaomise drama "Shin-yakata Banzei no Ishizue", which was produced by Arashi Koroku I at Ebisuya Kichirôbê's theater. 11th lunar month of 1736: Shirotarô played the role of the yakko Kansuke in the kaomise drama "Shin-yakata Imosegura", which was produced at Hayagumo Chôdayû's theater by Mizuki Takenosuke. 11th lunar month of 1737: Shirotarô played the role of Nagao Izunojô in the kaomise drama "Hachiman Tarô Denju no Tsuzumi", which was staged at Ebisuya Kichirôbê's theater and celebrated the shûmei of Yoshizawa Sakinosuke II. 11th lunar month of 1738: Shirotarô played the role of Hamamatsu Gensuke in the kaomise drama "Neko no Koneko", which was produced at Hoteiya Umenojô's theater (Minamigawa no Shibai) by Mizuki Tatsunosuke II. 5th lunar month of 1739: first Kabuki adaptation of the Matsuda Bunkôdô, Takeda Izumo I, Takeda Koizumo, Miyoshi Shôraku and Asada Kakei puppet theater drama "Hirakana Seisuiki"; Shirotarô played the role of Kajiwara Genta [casting]. Fall 1739: Shirotarô went to Ôsaka. 12th lunar month of 1739: Shirotarô played the role of Nagoya Sanza in the drama "Kewai Musha Ômi Genji", which was produced at the Ônishi no Shibai by Yoshizawa Ayame II. Fall 1740: Shirotarô went back to Kyôto. 12th lunar month of 1740: Shirotarô played in the drama "Chinpô Sandai Gatana", which was produced by his son Sakakiyama Jûtarô I at Hayagumo Chôdayû's theater and also starred his adoptive father Sakakiyama Koshirô I. The title of this drama, literally "The Rare Treasure - Three Generations of Swords" , was an allusion to the three generations of actors of the Sakakiyama clan sharing the same stage. 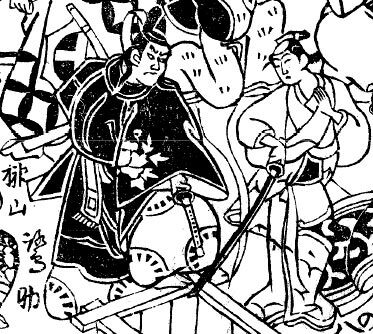 8th lunar month of 1741: the play "Shin Usuyuki Monogatari", which was originally written for the puppet theater, was adapted for Kabuki for the first time, in Kyôto at Hayagumo Chôdayû's theater; Shirotarô played the roles of Saisaki Iga-no-Kami, Iwano-no-Kami and Dankurô [casting]. 11th lunar month of 1741: Shirotarô played the role of Ishikawa Akuemon in the kaomise drama "Imayô Shinoda Zuma", which was produced by Nakamura Kumetarô I at Miyako Mandayû's theater. 11th lunar month of 1742: Shirotarô played the role of Sadaemon in the kaomise drama "Yamato-fumi Kaoyo Hinagata", which was produced at Ebisuya Kichirôbê's theater by Sakata Ichitarô. This was most likely the last stage appearance of his adoptive father Sakakiyama Koshirô I. 11th lunar month of 1743: Shirotarô played at Hoteiya Umenojô's theater the role of Fukushima Tatsubei in the kaomise drama "Yomeiri Ôshimadai", which was produced by Nakamura Kumetarô I and celebrated the shûmei of Sanjô Mankatsu. 1st lunar month of 1744: Shirotarô's rank in the Kyôto hyôbanki, tachiyaku section, fell one rank below jô-jô-kichi (superior - superior - excellent). 11th lunar month of 1744: Shirotarô played at Hoteiya Umenojô's theater the role of Watarai Gôsuke in the kaomise drama "Tanba Yosaku Kameyama Kayoi", which was produced by Nakamura Kumetarô I. 1st lunar month of 1745: Shirotarô's rank in the Kyôto hyôbanki, tachiyaku section, was back to jô-jô-kichi (superior - superior - excellent). 11th lunar month of 1745: Shirotarô played at Hoteiya Umenojô's theater in the kaomise drama "Toragoyomi Hoteibukuro", which was produced by Nakamura Kumetarô I. 11th lunar month of 1746: Shirotarô played at Miyako Handayû's theater the role of Tsukioka Naiki in the kaomise drama "Fukki no Ôshimadai", which was produced by Somematsu Shichisaburô I. 15th day of the 6th lunar month of 1747 : his adoptive father Sakakiyama Koshirô I died in Kyôto. 11th lunar month of 1747: Sakakiyama Shirotarô I and his elder son Sakakiyama Jûtarô I respectively took the names of Sakakiyama Koshirô II and Sakakiyama Shirotarô II, performing together in the kaomise drama "Teikin Ôrai Manzoku Kagami", which was produced by Nakamura Matsubê I at the Kitagawa no Shibai; their stage partners were Yamashita Matatarô I, Takenaka Heikichi, Fujikawa Heikurô, Fujioka Daikichi, Nakamura Kiyosaburô I, Nakamura Shirogorô III, Kasaya Matakurô I, Asao Motogorô I and Sanogawa Hanazuma II. 11th lunar month of 1748: Koshirô played at Hayagumo Chôdayû's theater the role of Yashiro Jônosuke in the kaomise drama "Jidai Makie Chûshingura", which was produced by Nakamura Matsubê I. 1st lunar month of 1749: Koshirô was sôkanjiku ("global kanjiku") in the Kyôto hyôbanki; his rank was kyoku-jô-jô-kichi (fast - superior - superior - excellent). 11th lunar month of 1749: Koshirô played at Ebisuya Kichirôbê's theater the role of the rônin Yogohei in the kaomise drama "Tokitsukazeyasu Keizu", which was produced by his son Sakakiyama Shirotarô II. 1st lunar month of 1750: Koshirô's rank in the Kyôto hyôbanki, tachiyaku section, was hakugoku-jô-jô-kichi (almost extreme - superior - superior - excellent). 11th lunar month of 1750: Koshirô played at Ebisuya Kichirôbê's theater the role of the yakko Arisuke in Fujikawa Sakoku's kaomise drama "Taira no Miyako Onna Ezôshi", which was produced by his son Sakakiyama Shirotarô II. 1st lunar month of 1751: Koshirô's rank in the Kyôto hyôbanki, tachiyaku section, was back to jô-jô-kichi (superior - superior - excellent). Koshirô played in the same theater the role of the Yamazaki farmer Yogorô in Fujikawa Sakoku's ni-no-kawari drama "Keisei Kane-ga-Fuchi". 11th lunar month of 1751: Koshirô played at Miyako Handayû's theater (Minamigawa no Shibai) the role of Kokonoe Tamiemon in the kaomise drama "Kyôganoko Asahi no Nishiki", which was produced by his son Sakakiyama Shirotarô II. 11th lunar month of 1752: Koshirô played at Hoteiya Umenojô's theater (Kitagawa no Shibai) the role of Kusunoki Masanari in the kaomise drama "Tenka Taiheiki", which was produced by Arashi San'emon IV and celebrated the shûmei of Sawamura Otoemon II. 11th lunar month of 1753: Koshirô played at Miyako Handayû's theater the role of Sagara Jôsuke in the kaomise drama "Hade Musume Bandachi Yakata", which was produced by Yamashita Ugenta II and celebrated the shûmei of Matsumoto Tomojûrô II. 2nd lunar month of 1755: first Kabuki adaptation of the 5 acts puppet theater drama "Ono no Tôfû Aoyagi Suzuri", which was produced by Sawamura Kunitarô I and staged at the Minamigawa no Shibai as a kaomise drama; Koshirô played the role of Ono no Tôfû [casting]. 12th lunar month of 1755: Koshirô played at Hayagumo Chôdayû's theater the roles of Momonoi Wakasanosuke and Ôboshi Yuranosuke in the kaomise drama "Homare Otoko Bandaigura", which was produced by Nanba Matsunosuke. 11th lunar month of 1756: Koshirô played at Hayagumo Chôdayû's theater the role of Kudô in the kaomise drama "Daimyô Bimandai Kuniiri Kamakura Kagami". 1st lunar month of 1758: Koshirô played in Kyôto at the Hirano no Shibai the role of Morihiko in the new year drama "Kume no Sennin Yoshino Zakura", which was produced by Kameya Jûjirô. 3rd lunar month of 1758: Koshirô went to the Kitagawa no Shibai. 10th lunar month of 1758: Koshirô played at the Kitagawa no Shibai the role of Nagoya Sanza in the drama "Keisei Hangonkô". 11th lunar month of 1758: Koshirô did not take part in any kaomise. 12th lunar month of 1759: Koshirô became jitsuaku and played at the Kitagawa no Shibai the role of Todoroki Gôemon in the drama "Bandai Fueki Hôrai Yakata". 1st lunar month of 1760: Koshirô's rank in the Kyôto hyôbanki, jitsuaku section, was jô-jô-kichi (superior - superior - excellent). 11th lunar month of 1760: Koshirô played at the Minamigawa no Shibai the role of Yotsugi Sehei in the kaomise drama "Ôshimadai Kitsune no Mukoiri". 1st lunar month of 1761: Koshirô was sôkanjiku ("global kanjiku") in the Kyôto hyôbanki; his rank was shin-jô-jô-kichi (truly - superior - superior - excellent). 11th lunar month of 1761: Koshirô played at Kameya Kumenojô's theater the role of Tada Mankei in Amano Kyûshichi's kaomise drama "Mineiri Futaba Genji", which was produced by Sawamura Kunitarô I. 1st lunar month of 1762: Koshirô's rank in the Kyôto hyôbanki, tachiyaku section, was shin-jô-jô-kichi (truly - superior - superior - excellent). 2nd lunar month of 1762: Koshirô played in the same theater the role of Jinbei in the drama "Futatsu Chôchô Kuruwa Nikki". 2nd lunar month of 1763: Koshirô played at the Kitagawa no Shibai the role of Shimizu Hyôe in the kaomise drama "Otowayama Renbo no Taki", which was produced by Nakamura Senzô. 3rd lunar month of 1763: Koshirô's rank in the Kyôto hyôbanki, tachiyaku section, was kô-jô-jô-kichi (meritorious - superior - superior - excellent). 11th lunar month of 1763: Koshirô did not take part in any kaomise. 11th lunar month of 1764: Koshirô played at the Minamigawa no Shibai the role of Kanki in the drama "Tanomi-agemasu Goken Butsusama" (similar to "Kokusen'ya Gassen"); the role of Watônai was played by Edosaka Kyôemon. 7th lunar month of 1765: Koshirô played in the same theater the role of Shunkan in the drama "Kajiha Kaze Zashiki Kyôgen". 11th lunar month of 1765: Koshirô did not take part in any kaomise. 11th lunar month of 1766: The actors Sakakiyama Koshirô II, Sakakiyama Shirotarô II and Sakakiyama Jûtarô II respectively took the names of Sakakiyama Sagisuke, Sakakiyama Koshirô III and Sakakiyama Shirotarô III, performing together in Tenmaya Kyûshichi's kaomise drama "Umayadogimi Shitennôji Kuyô", which was produced by Edosaka Kyôemon at the Kitagawa no Shibai. This was Sagisuke's isse ichidai performance; he retired from the Kabuki stages to become a playwright. 2nd day of the 7th lunar month of 1767 : his elder son Sakakiyama Koshirô III died. 11th lunar month of 1767: his younger son Sakakiyama Shirotarô III and Sakakiyama Koshirô III's nephew Sakakiyama Kotarô respectively took the names of Sakakiyama Koshirô IV and Sakakiyama Shirotarô IV at Hayagumo Chôdayû's theater. 9th day of the 1st lunar month of 1768 : Sagisuke died in Kyôto; his tombstone was located in the precincts of the Myôhôji temple in the Imperial city. 7th day of the 3rd lunar month of 1768 : his younger son Sakakiyama Koshirô IV died. Sakakiyama Sagisuke was a popular and talented tachiyaku actor, who spent most of his career in Kyôto. He did not bother to go to perform in Edo and stopped performing in Ôsaka at the end of the 1720s, preferring to enjoy his fame in the Imperial city. Just like his adoptive father Sakakiyama Koshirô I, he was also the son of a rônin and excelled in rônin roles. He was the best actor of the Sakakiyama clan, reaching the hakugoku-jô-jô-kichi rank in 1750. His line seemed secured because of his two sons but they unfortunately died around the same time as their father. The 9th day of the 1st lunar month of the 5th year of the Meiwa era was the 26th of February 1768 in the western calendar. The 7th day of the 3rd lunar month of the 5th year of the Meiwa era was the 23rd of April 1768 in the western calendar.